Russian justice being what is, it is exceptional when the chief executive of a company owned by Oleg Deripaska (right) is arrested and carried off to prison on charges of fraud. As the days lengthen through which Deripaska’s man must spend behind bars – 16 as of today — interrogated by the Investigative Committee of the General Prosecutor, the likelihood grows that it is Deripaska himself who is the real target. Sources familiar with the matter claim this is the preliminary for an event being planned once the Winter Olympic Games conclude in Sochi on February 23. Not the ski jump, though: the sources claim this time it’s Deripaska for the high jump. Sergei Khvostikov, chief executive of Deripaska’s Kondrovskaya Paper Mill, was arrested on November 22, three months after an announcement by regional prosecutors that they had opened an investigation of criminal misconduct by the company and its management. By the time he was packed off to jail, Khvostikov had been out of his job at the mill company for three months. The mill is located at Kondrovo, on one of the tributaries of the Ugra River, in the Dzerzhinsky district of Kaluga region. The site is about 1,000 kilometres southwest of Moscow. It was in this area in 1480 that Russian resistance to the Tartar armies commanded by Akhmat, Khan of the Great Horde, succeeded in stopping their northward advance on Moscow, and decapitated the Tartar leadership Those events are known in Russian history as “the great stand on the Ugra River”. The mill produces a variety of paper and cardboard products; it is the domestic market specialist in disposable hygiene products used by children and adults, diapers, and sanitary napkins, as well as medical cloths. Its sales to the domestic market are protected by import duties of 5% to 9%. 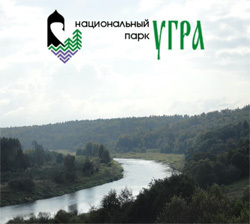 For many years, starting in the Soviet period and continuing until now, the mill has been a well-known contributor of chlorine and other chemical contaminants to the river and the surrounding Ugra National Park. The stripping of cash from the mill company has made it cheaper for the Kondrovskaya mill management and its parent, the Deripaska holding, to pay pollution penalties and dump the paper processing bleach, rather than invest in filtration and water treatment technologies. This study, spelling out the pollution problems, was released just weeks ago by an American research team. The chemical pollution, if paid for, is legal. 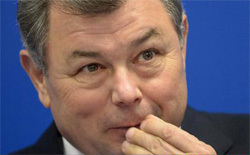 Bulletins from the regional prosecutors’ office have identified the charges against Khvostikov as putting the Kondrovskaya mill into false bankruptcy; abusing his authority to divert the company’s cash and failing to pay the papermill’s employees; and fraud. According to local press announcements from regional prosecutor Dmitry Demeshin and his deputies, between 2009 and June 2013 the papermill was looted of cash, much of it borrowed from banks and then spent on purposes not defined in the loan agreements. The crimes charged are big; the numbers small. Loan value is reported to be Rb40 million ($1.3 million); debts to workers and suppliers, Rb1.5 million ($469,000). Other Kaluga press reports, citing the regional branch of the Labour Ministry, claim that as of November 1, the debts to 527 workers for unpaid salaries came to more than Rb29 million ($906,000). Yet another report suggests that the obligations on which Kondrovskaya has now defaulted, including the wage bill, total Rb400 million ($12.5 million). Until there is a court-supervised audit, noone is certain how much, if anything, has been stripped from the company. For the first nine months of 2013 ,the mill’s revenues are reported to have fallen more than twofold to Rb237.4 million ($7.4 million), while its accumulated loss as of September 30 is said by regional media to be Rb252.56 million ($7.9 million). Not paying papermill workers is not new for Deripaska’s Continental Management, the holding which in addition to Kondrovskaya, has owned timber sources, as well as the now shuttered Bailkal Paper Mill. A rebellion by unpaid workers at the Baikal plant in 2009 led to international press coverage. In the past Continental Management has claimed to have an annual turnover of more than $300 million, but its financial place in Deripaska’s Basic Element holding, is unclear. Deripaska himself claims he is a big investor in waste water treatment: “Regarding our holding’s ecological strategy in general, we are constantly investing in modernization, reducing emissions and improving energy efficiency”. Papermills are the shrinking violets of Deripaska’s business. Had the Governor of Kaluga, Anatoly Artamonov, not explicitly identified Deripaska as the owner of the Kondrovskaya Paper Mill, it would be difficult to find an admission of this fact by Deripaska, or Basic Element, or Continental Management, or Kondrovskaya itself. It has a website, but like Continental’s, that hasn’t worked for several years. There used to be a page on the Basic Element website devoted to these timber and paper production assets, but this no longer exists. Artamonov claimed he and Deripaska then discussed meeting in person “in the near future” to discuss the problem. “But I think it will change little.” The next day Artamonov leaked the telephone conversation, and the meeting has yet to materialize. Artamonov, 61, is a native of Kaluga whose entire career has been served in the region. He was elected vice-governor in 1996, and in 2000 he won the first of his gubernatorial terms. He is now in his third term. Artamonov issued his disclaimer after November 21. On that day Deripaska filed suit in the Arbitrazh Court of Krasnoyarsk Krai, accusing Artamonov, Komsomolskaya Pravda of Kaluga, and Inform Bureau of Krasnoyarsk of publishing false information and damaging Deripaska’s business reputation. The case file is А33-16765/2013, and Deripaska’s claim, together with the exact words he is complaining of, can be read in full here. Deripaska’s lawyers are demanding published retractions from the media, plus one rouble from the Kaluga governor for “moral harm”. Krasnoyarsk is the Siberian region where the second largest of Deripaska’s aluminium smelters operates. It is 4,300 kilometres to the east of Kaluga. 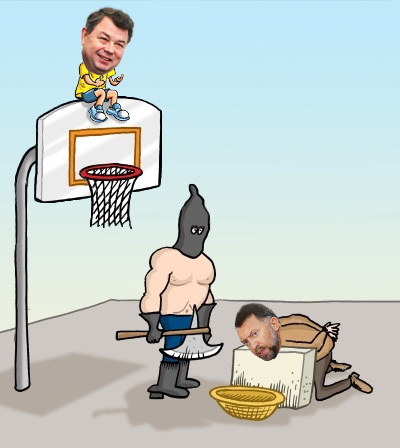 For the time being, the lawyers for Artamonov and the media are not in a hurry to produce the evidence on which they relied for blaming Deripaska for the financial collapse at the papermill. Deripaska’s lawyers are in no hurry to prove to the court what business reputation Deripaska currently has, and whether it’s possible for Russia’s most heavily indebted man to suffer moral harm from the reported criticism. Komsomolskaya Pravda of Kaluga doesn’t want to comment. Meanwhile, the Kaluga region prosecutors are tucking into the Kondrovskaya case with unusual zeal. Iskrina Basulina is the Senior Assistant Attorney in the regional Prosecutor’s Office. For the evidence she refers to the Kaluga branch of the Investigative Committee. Its spokesman is Liliya Moshkova; she is not responding to telephone calls and messages. On November 20 police from the Committee tried to force their way into an apartment belonging to a board member of the papermill, but withdrew after establishing the man they were after wasn’t at home. At much the same time, police in the Moscow region arrived at a hospital where another board member was being treated. The object of their investigation appears to have been to check the medical details of their target’s illness. The day after Deripaska filed in Krasnoyarsk court was the day the police took Khvostikov to prison in Kaluga. Here is the prosecution’s press release. And here’s another statement from the investigators explaining their evidence. On December 4 there was a fresh announcement that the prosecutor of Dzerzhinsky district of Kaluga region “is taking all possible measures to protect the rights of workers of the Kondrovskaya Paper Mill in order to recover arrears of wages”. Foreclosure and sale of the land on which the mill stands may follow, the statement warned. Nothing has been heard from Khvostikov. The rub for Deripaska is that as Khvostikov’s imprisonment drags on, he may agree to testify for the prosecution. If that happens, never before in Russian business history will a rouble in damages have threatened to cost so dear.